Marvel comic book hero The Thing joins Lorena and Mark O'English on the couch at the Museum of Pop Culture in Seattle. 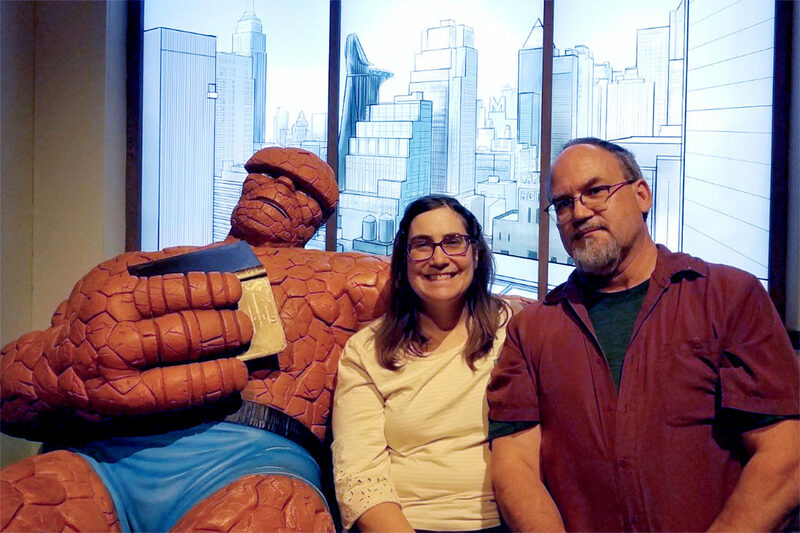 PULLMAN, Wash. – Portrayal of nuclear science issues in comic books over the past 60 years will be the focus of the next Common Reading Program presentation, featuring Mark O’English, WSU Libraries’ Manuscripts, Archives and Special Collections archivist. The address will begin 5 p.m. Tuesday, Feb. 5, in Todd Hall 216, on the WSU Pullman campus. The public is welcome at this lecture. Once hailed as the shining savior of humanity, nuclear power has moved, sometimes dramatically and sometimes gradually, to generally being viewed as a mistake, says O’English. In his presentation, he will not look at the science of nuclear power, but rather at how depictions of it have evolved over time in pop culture. He uses comic books as one exemplar, considering representations that range from the serious to the absurd. O’English has been a freelance researcher and writer for Marvel Entertainment, the New York City‑based parent organization for Marvel Comics. A Klamath Falls native, O’English began work at WSU Libraries in 2001. He writes and lectures on a variety of topics, including WSU history. 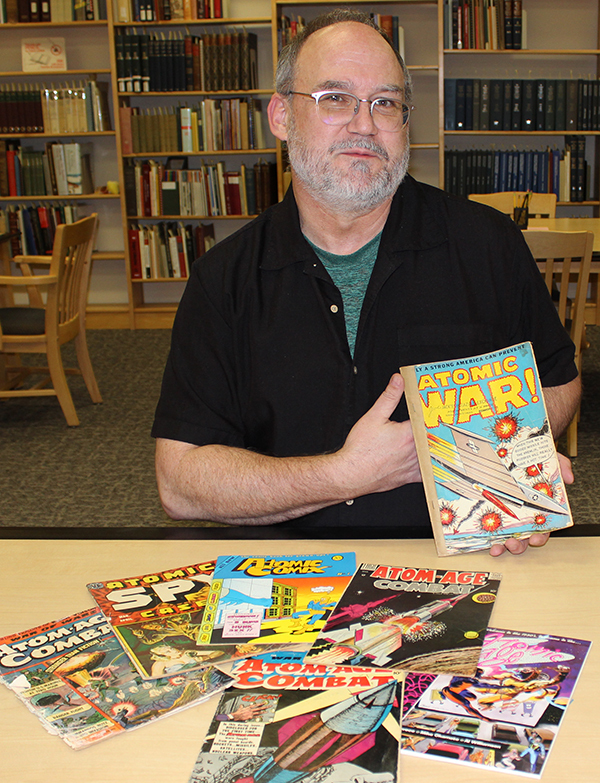 Mark O’English, displays a sampling of comic books showing pop culture’s evolving take on atomic issues. An avid appreciator of technology, he has produced publicly available how‑to tutorials on video and audio digitization of library collections. He studied mathematics and psychology at Oregon State University, and earned a master’s degree in library and information science from the University of Washington. The lecture is one of several events hosted and co‑hosted by the Common Reading Program. Since 2007‑2008, it has developed programming around a single book that was selected to stimulate academic discussions among students and faculty. The books have been used in a diverse set of classes offered to first‑year and other students. The book for 2018‑19 is “Soonish: Ten Emerging Technologies That’ll Improve and/or Ruin Everything.” Authors Kelly and Zach Weinersmith visited the Pullman campus in October. For more information, visit the Common Reading website.